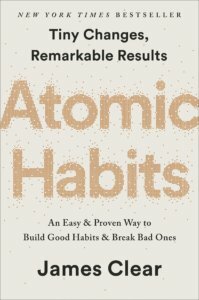 Travis (Upton) and I (Matt) both are reading Jim Clear’s book, Atomic Habits: An Easy & Proven Way to Build Good Habits & Break Bad Ones. We’re finding it tremendously helpful in our own journey to live a great life – a life of purpose, of joy, of using time wisely. We recommend it highly to all of you because habits are such powerful actions in our lives. Bad habits take us away from our purpose, from our joy; good habits enable us to live with purpose and joy. Utilizing Your Physical Surroundings – At work or at home you can arrange your physical surroundings to reinforce and even spur good habits. For example, if you want to drink more water – place bottles of water at various places in your home or office where you are throughout the day. Want to write more personal notes to your clients/customers: put a stack of note cards on the corner of your desk – with envelopes stamped and ready to use. Stack Your Habits – If you drink coffee every morning, perhaps lay your vitamins out beside your coffee maker before you go to bed. You’ll remember to take them that way. Or, if you want to spend more time praying, spend 10-15 minutes praying each morning before allowing yourself to read the morning paper. Habits – Good ones enable us to live lives of greatness. Cultivate good habits and watch your life take off!